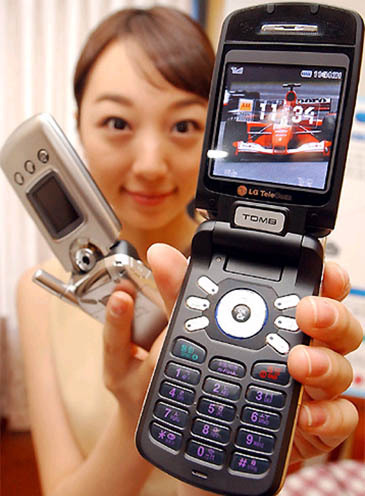 LG Electronics unveiled on Monday (Nov. 15, 2004) world's first terrestrial digital multimedia broadcast-receiving mobile phone, and demonstrated its functions. The phone, weighing 170 grams, will be operated under homegrown technology called the terrestrial digital multimedia broadcasting (DMB), which will be commercially launched from next year. Terrestrial DMB allows people to enjoy seamless video, CD-quality audio, and data on the move through mobile gadgets like cell phones or in-car devices. Medium-sized terminals for terrestrial DMB have been disclosed several times but it is the first time in the world to incorporate this function into a cell phone. The DMB mobile phone adopts the DMB-receiving System-on-Chip (SoC) that the company developed last month. The chip enables the user to watch terrestrial broadcasts and at the same time talk on the phone. LG Electronics has technologically brought the usual home TV antenna function aimed at receiving VHF broadband DMB into the small phone. The handset also adopts DSP (Digital Signal Processor)-based SoC (System-on-Chip), mobile phone-fit low power consumption and design technologies for making the device small. The terrestrial DMB phone is profoundly significant in that it has remarkably resolved problems surrounding the bulky terminal size and power consumption. The previous terrestrial DMB terminals had no mobile phone functions, and they took the form of bulky-sized terminal-only or PDAs. This breakthrough has proved LG Electronics technologies in DMB-receiving devices to be the industry's top level together with its satellite DMB phone "SB-100" unveiled in May. It has also provided the company a momentum to lead a new multimedia mobile handset market combining broadcasting and telecommunication. Thus, LG Electronics is poised to use its worlds exclusive, sophisticated DMB technologies, and push for the development of state-of-the-art broadcasting and communication devices by reflecting the concept of five anys (anytime, anywhere, any network, any device, and any service) that the ubiquitous information communication and broadcasting network pursues, beyond the mere fusion technologies of broadcasting and communication. Baek Woo-Hyun, CTO and president of LG Electronics, said. "The terrestrial DMB phone, the first of its kind worldwide, adopts our own-developed handset design technologies and terrestrial broadcast-receiving chip, thus giving it competitive superiority in size, performance, and convenience in use. This terrestrial DMB phone has opened up a new world where people can watch terrestrial DMB TV and simultaneously speak via a mobile phone." LG Electronics has invested 20 billion won in developing the terrestrial DMB phone for two years with 130 researchers (including 90 masters degree and Ph.D. holders) engaged in the project. The company has filed about 150 patents applications domestically and overseas for technologies including H.264 video decorder-enabling technology. 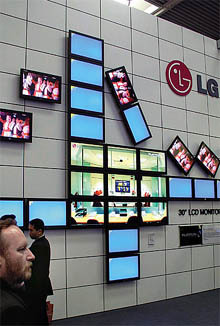 LG Electronics, backed by its worlds first DTV technologies, takes advantage of its technological experience in integrating DAB(Digital Audio Broadcasting) and FEC(Forward Error Correction) technologies, and is exerting every effort to develop various broadcasting-related technologies such as satellite and terrestrial DMB and DVB-H, and related handsets. Starting with the terrestrial DMB phone, the company will not only introduce related products in time for commercialized services of domestic terrestrial and satellite DMB, but also continue to unveil products with receiving functions and consumption power remarkably enhanced, thus further stepping up its market leadership. Also, LG Electronics is set to use its worlds first terrestrial DMB phone technologies and aggressively penetrate the global market including Europe, South America and China with its domestic terrestrial DMB standard. To respond to overseas terrestrial transmission methods, it will push to preoccupy and lead the domestic terrestrial DMB handset market. 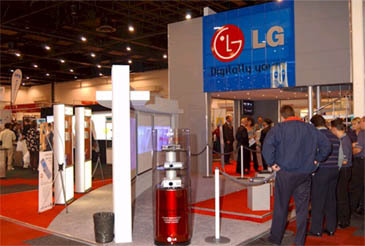 Thus, as part of efforts to establish the domestic terrestrial DMB standard as global standard, LG Electronics is now participating in activities for enacting domestic next-generation broadcast forum regulations to affirm its DMB technology as the domestic standard, and also is pushing to have the technology adopted as the global standard by World DAB Forum. 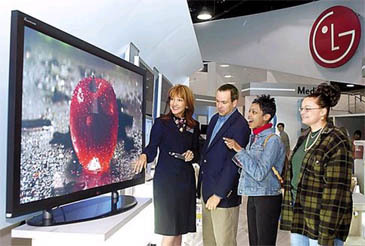 LG Electronics' 76-inch flat-panel TV is on display on the annual Consumer Electronics Show (CES) in Las Vegas. To disseminate its DMB standard worldwide, the company is currently conducting overseas road shows and participating in overseas exhibitions for promotion. Such efforts are winning favorable response from Britain, Germany, and numerous Asian nations, thus brightening the prospect that the company"'s DMB technology is adopted as each nations standard. LG Electronics' development of terrestrial DMB phone is the first of its kind worldwide, and has enhanced the possibility of Koreas commercialized services of terrestrial DMB. There are reports on DMB test services conducted aboard a train in Germany, and in some areas of China. These bids, however, targeted multiple people-watched TV, while the company's technology has targeted a personal receiver model. Also, the terrestrial DMB standard is the first mobile broadcast standard established by Korea's own design. Likewise, it is a new standard established by multimedia technologies, based on the global standard of the existing DAB system. Thus, Korea, led by LG Electronics, is expected to lead the global digital mobile multimedia broadcast technologies. LG Electronics DMB SoC is the world's first to integrate broadcast-receiving section and media-process (audio-visual signal treatment) section into one chip. It also adopts picture-enhancement mobile-XD engine. Also, the company applied its own-developed algorithms aimed at enhancing receiving sensitivity, as well as reduced power consumption through the audio-visual treatment-enabled platform based on digital signal processor. The terrestrial DMB SoC can be applied to mobile phones, notebook computers, PDAs, and car terminals, and thus it is expected to greatly activate the domestic terrestrial DMB services and expand mobile phone market. As such, the domestic terrestrial DMB standard, which has a great possibility of becoming the Europe's mobile communication standard, will likely penetrate both domestic and overseas markets aggressively. If DMB services go into full swing, this will generate huge ripple effects in the whole IT industry including parts, devices, contents and infrastructure. The galvanization of DMB services will highlight DMB-related chip-set display, batteries, and storage devices as core elements, thus helping develop related industries, and in turn boosting demand for related terminals, car electronics devices, and new portable devices. This move will likewise invigorate related contents, services, and infrastructure, thus having huge ripple effects on the whole IT sector. Terrestrial DMB will become a radio-like concept in the long term and will be available with all IT devices. According to surveys conducted by Electronics and Telecommunications Research Institute, and Korea Information Strategy Development Institute, the market size will top a huge 8.5 million subscribers by 2010. DMB (Digital Multimedia Broadcasting): provides CD-quality-level sounds, data and video services via mobile handsets, while their holders move or stay in certain places. It is classified into terrestrial DMB and satellite DMB according to transmission means. DSP (Digital Signal Processor): an integrated circuit that can treat digital signals in the hardware way. 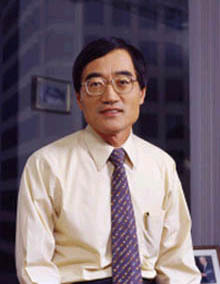 Adopts a circuit that can treat repetitive computation at high speeds to treat digital signals at high speeds. DAB (Digital Audio Broadcasting): Audio broadcasting that can transmit not only CD-level high quality sounds, but also texts, graphics, and videos. The basic standard is Eureka-147. Digital multimedia broadcasting (DMB) is a mobile broadcasting service that allows people to watch broadcasts on both their cell phones and specially developed receivers. DMB is divided between terrestrial and satellite services, with the former operating through transmitting stations on Nam-san and Gwanak-san mountains. Terrestrial broadcasters like KBS and SBS are preparing to provide the terrestrial DMB service in the first half of next year at the earliest. With LG Electronics' recently revealed terrestrial DMB cell phone, users can now make phone calls while they watch broadcasts. The company explained that it was the first time that a terrestrial DMB phone had been developed with normal cell phone functions. LG Electronics has committed 20 billion won and 130 researchers to developing the terrestrial DMB cell phone over the past two years. In the wake of LG Electronics' breakthrough, other handset makers such as Samsung and Pantech are expected to step up their manufacturing work to produce competing products that offer consumers the same degree of convenience. Samsung, LG and Pantech have all developed satellite DMB phones and are waiting for the airborne service to launch. The satellite DMB service was originally scheduled to kick off in September after TU Media, a venture involving Korea's biggest mobile phone operator, SK Telecom, launched a satellite in the first half of the year. But the Korean Broadcasting Commission put the brakes on a launch until after next year in consideration of KBS, which is preparing for the terrestrial DMB service. Samsung Electronic is also developing a dual mode DMB phone, which enables people to receive terrestrial and satellite DMB services on the same handset. 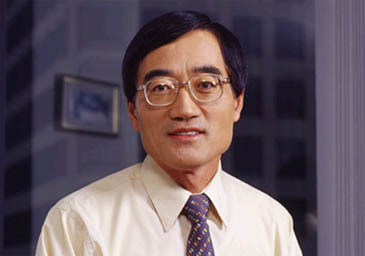 LG Electronics CTO Baek Woo-Hyun said Monday that the company would develop satellite DMB receptor chips, which are currently imported from overseas, within this year and produce its own dual mode DMB phones by the end of 2005. 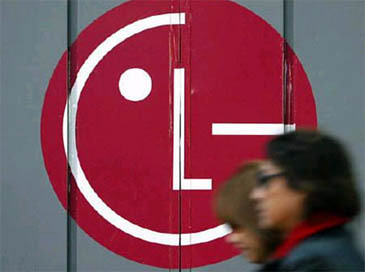 On the back of such technical competitiveness, LG said it will preempt the lucrative DMB phone market, which is expected to take off in years to come. The Electronics and Telecommunications Research Institute (ETRI) predicted the local market for terrestrial DMB phones would reach 539 billion won in 2006 and 1.32 trillion won in 2010.